Simple yet highly effective, the Bust A Cap® quickly turns an existing Maglite into a portable life-saving device. 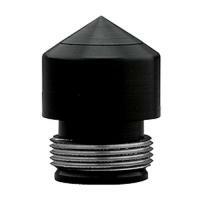 The solid steel pointed cap be easily added in seconds. Simply remove the end cap, O-ring and spring from the light and screw the new cap in its place. The secure fit and sturdy design keeps the Maglite watertight. Now, this item can be used by anyone to effectively break glass with just a single hit without damaging the flashlight. This style fits Maglite models that use AA batteries and is proudly made in the USA.